The Glorkian Warrior is back! Don't worry, he hasn't gotten any smarter. The Glorkian Warrior was doing so well! He almost had that rampaging space snake under control—when Buster Glark, his villainous rival in the Glorkian Corps, showed up to make fun of him! Buster laughed so hard at the Glorkian Warrior's misfortune that he gave himself the hiccups. And that was just on the first page of this book. Things are only going to get worse from here for the Glorkian Warrior. But at least there will be plenty of pie at the end. 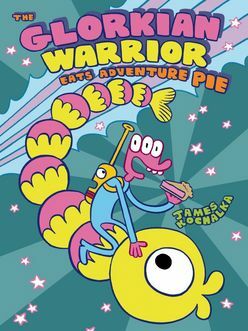 James Kochalka brings back his goofiest creation, the Glorkian Warrior, in the second of this silly space trilogy!